Grand Opening celebration to take place on Saturday, October 13. 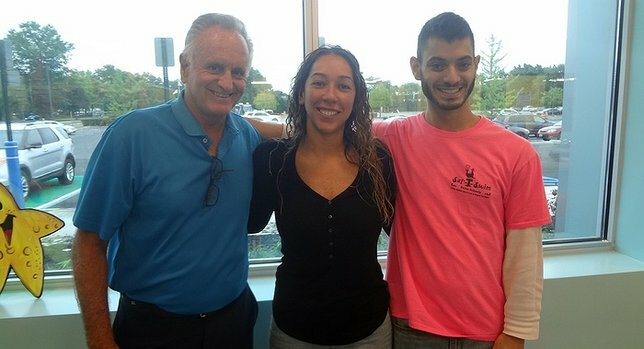 (L to R): Owner Jim Hazen at Saf-T-Swim's new Melville location with managers Jessica and Vincent. Melville, NY - October 10, 2018 - Contrary to general opinion, the number thirteen can indeed be a lucky number…especially when it comes to Saf-T-Swim, Long Island’s top swimming school, which is celebrating the Grand Opening of their new Melville location at 515 Broadhollow Road this Saturday, October 13. The location marks the thirteenth Saf-T-Swim facility opened by owner Jim Hazen, who has made it his mission in life to make the waves a safer place for kids of all ages. Saf-T-Swim is a swimming school that caters to youngsters, but also welcomes anyone – young, old, and in-between – who is looking to learn the skills needed to stay safe when in the water. Hazen, a Miller Place resident with a background in lifeguarding and athletics, founded the first Saf-T-Swim location in 1984 in Bay Shore, and after some early initial success, the business steadily grew into what it is today- Long Island’s premiere swimming school, with locations in Bellmore, East Meadow, Levittown, Westbury, Bohemia, Commack, Deer Park, Riverhead, and more. For a full list of Saf-T-Swim locations, please click here. When it came to opening his 13th Saf-T-Swim location in Melville – which will be holding its Grand Opening celebration this Saturday, October 13th, with a rain date of October 14th – Hazen said he typically doesn’t look to expand his watery empire at any given time, but when the opportunity presents itself, he's more than ready to do so if he feels it will benefit the members of the surrounding community. Once the location was chosen, Hazen noted that the least fun aspect of opening a new location came into being- dealing with the bureaucracy and red tape generally involved in establishing any new business. However, like a trooper, he got through the process while strictly adhering to all the rules and safety guidelines put forth both by the Town of Huntington and the Board of Health, in many cases exceeding them. In addition, Hazen said, the Melville Saf-T-Swim represents something of a change to the normal formula he follows when establishing a new location. Previous Saf-T-Swims are equipped with standard locker rooms, but Melville eschews this time-honored approach in favor of a more modern-day sensibility- individual, private changing rooms. The Melville Saf-T-Swim boasts a swimming pool 22 feet wide and 57 feet in length, raging in depth from 3 feet to just under 5; an ideal setup for anyone looking to learn their proper swimming strokes. While classes are specialized with teaching the younger set, anyone looking to learn how to swim are welcome to come down and experience all that Saf-T-Swim has to offer. However, Saf-T-Swim isn't just about learning your water basics; it's also about having fun with your friends. The facility can host birthday parties on the weekends in a large party room that can be tailored for any occasion, in addition to private access to the pool for all partygoers. Melville’s Grand Opening celebration on October 13th promises to be a fun and exciting family event, with Hazen noting that a ribbon-cutting will be held at 10:30 a.m., followed by festivities including an ice cream truck, an inflatable bounce house, a petting zoo, and music provided by a local radio station D.J. To find out more, please visit www.saftswim.com. Subject: LongIsland.com - Your Name sent you Article details of "Saf-T-Swim to Hold Grand Opening of Melville Location; Swim School Celebrates Thirteenth Location"